Unfortunately, it had been a couple weeks since I cooked an entire meal from scratch. This week we ended up with apples, onions, and pork chops that needed to be used, so what a perfect storm for Martha Stewart’s Pork chop recipe with apples and onions! I’ve posted the recipe before, so I won’t waste your time with a repeat post… but as I was cooking in the kitchen, I genuinely felt happy. For most people, cooking is a chore and some thing to dread at the end of a day. It seems for me, that the more exhausted I am, the more I seek solace in the kitchen. In a lot of ways it is a creative outlet, as well as being an opportunity for me to provide some thing for my family. Plus, I love cooking infinitely more in my new, gorgeous kitchen. I am particularly fond of my ovens [now that I learned how to use them]. I mean, check out these beautiful golden-brown potatoes… Thank you, broil! It has been an exhausting week. I started taking Zumba classes, I have been running errands with the girls, going to doctors appointments, and every thing else life throws at us on any given week. Cooking and working out have really helped me from feeling overwhelmed. Photography has helped, too, especially when I have such an adorable model. J surprised me with tickets to see The Shallows tonight, so I have an unexpected date to look forward too. Yes, this week has been tough but also rewarding in so many little ways. I hope yours has been too! Did you know Thanksgiving is only NINE days away?! Mamas are busy ladies, and it’s understandable that we end up unprepared during most of the holiday season. These important meals sneak up on you, and there’s panic when you realize you have no plan for what to bring. I’ve only hosted Thanksgiving once, but since becoming a married woman, I feel it’s one of my responsibilities as a member of the family to bring something to Thanksgiving dinner. Growing up, you usually have 1-3 women who do ALL the cooking for 30 people. When you’re excuse is being a 10 year old kid, ok don’t pitch in, but once you have your own job and apartment, it’s time to bring some thing to Thanksgiving dinner. I felt I had even less of an excuse not to contribute when I was a newlywed, and all the women of the family had just spent hundreds of dollars on getting me kitchen supplies. It was time to put those handy tools and supplies to work! Anyway, in light of the fast approaching holiday, I wanted to share my greatest Thanksgiving hits with you. It’s intimidating to share a recipe with family for the first time, especially during such an important meal. These recipes are pretty easy and don’t require too many ingredients. So, if you still don’t know what you’re bringing to Thanksgiving, hopefully some of these ideas will inspire you! Pumpkin Cupcakes – I brought these to my first Thanksgiving ever, with J’s family. If you’ve never brought anything to a Thanksgiving dinner before, you can’t go wrong with dessert! Since it was the first time I had ever spent Thanksgiving with a family other than my own, I wasn’t sure who typically brought what. I knew that in my family, certain members were known for certain dishes [everyone LOVES my Aunt Julie’s rolls, and Grandpa always did the gravy, etc.] so I didn’t want to step on anyone’s toes by attempting a traditional side-dish. This recipe is delicious and a great alternative to having too many pies. Sweet potato hash – My second year with J’s family, was our first Thanksgiving as Mr & Mrs. I felt more confident to bring a dish to go with dinner, so I brought this sweet potato hash. My first year, I noticed that his family only did the sweet potatoes with marshmallow on top, so I thought I’d bring a savory version too. It was a big hit! Not to mention, a healthy hit, too! This recipe is a vegetarian version, but you can swap out the veggie patties for sausage patties and it tastes GREAT. Spinach Salad with pear and cranberry – I have to admit, while I found this recipe on my own, I was attempting to imitate a salad my Aunt Julie would bring to either Thanksgiving or Christmas dinners. When I was younger I thought the only dressing that could go on a salad was ranch. In the name of trying new things, I picked up a scoop of her sweet, fruity salad and immediately fell in love. I knew that the first Thanksgiving dinner I hosted, this side would definitely have to be on the table. I was cooking for 20+ traditional Italians and I wasn’t sure how a salad without Italian dressing would do with J’s crowd. Luckily, everyone LOVED it! In fact, I completely ran out of salad as people were asking for second and third helpings. Cornbread stuffing – For the most part, I try to stick to a gluten free diet… but around the holidays that can get pretty tough! Once I found Martha Stewart’s cornbread stuffing, it was a total game changer. I LOVE this recipe, and so did the rest of the family. I was able to make it gluten free by making my own corn bread from scratch, but you can make it as easy or as difficult as you want depending on how much time you actually end up having. Those are by far the best recipes I’ve ever brought to Thanksgiving dinners in the past. Like I said, if you have extra time or are feeling especially domestic, you can personalize these recipes as little or as much as you want to! For the salad, I make my own candied pecans to sprinkle on top and some times, I even make the dressing from scratch. Hopefully some of these recipes inspire you and take some of the stress out of planning for the big turkey dinner next Thursday! Good Luck! Cut avocados in half and carefully remove the pits. Cube the avocado, scoop out of the skin and place in a bowl. Squeeze lime juice from half the lime over the avocado and sprinkle with salt, toss to coat. Smash avocado with fork. Finely chop the rest of the ingredients and fold into the avocado mixture. Serve with tortilla chips! Personally, we put a dollop on top of some piping hot quesadillas. Enjoy! Don’t let the name scare you, these delicious morsels are the Filipino version of an egg roll and they are DELICIOUS. When people think of San Diego, they think “Mexican,” but there is such a huge variety of different backgrounds and cultures in California, I couldn’t even begin to describe them all to you. When I think of lumpia, I think of October. I know it doesn’t seem like a seasonal food, and indeed, none of the ingredients are seasonal, But I used to have this tasty meal at our former parish’s Fall Festival every year. I grew up going to Guardian Angels parish, and the feast day for Guardian Angels is in early October hence the festival. The Filipino women of our parish spend HOURS making these, months ahead of time. They would freeze their hard work, and them bring them out at festival time, fry them up, and serve them to raise money for the church. That is why lumpia = October to me. It has been probably over 5 years since I last went to Guardian Angel’s fall festival. I haven’t attempted to recreate the recipe until this year, and I was wildly successful. The only hard part is rolling them as tight and as skinny as they are supposed to be. 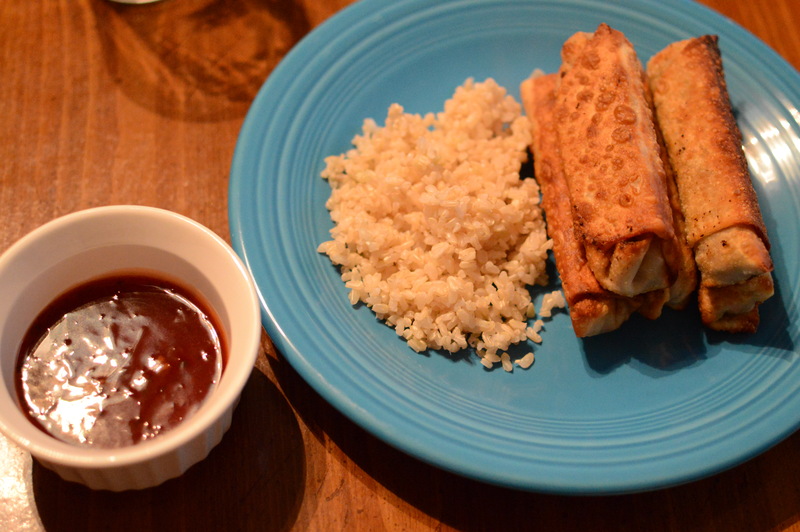 Unlike egg rolls, these are not supposed to be fat. In fact, they are supposed to resemble more of a taquito. Brown beef in a skillet over medium heat until almost completely cooked. Drain the fat, cool, and then process in food processor or chop up into fine pieces with fork. Prepare wrapper (by separating) and place on a separate plate. Place 1 to 2 T of filling in the center of the wrapper. After you have assembled all the lumpia, heat your oil to 375 degrees (you can do this in a deep fryer, or just heat oil in a skillet and take the temp with a meat thermometer). Cook until golden brown, turning often, approximately 3 minutes. Drain on paper towels. Serve with sweet and sour sauce, I personally like La Choy which can be found in any grocery store 🙂 Enjoy! It’s fall y’all! You should have expected an apple recipe to soon follow my post about our trip to the apple orchards, so here it is! 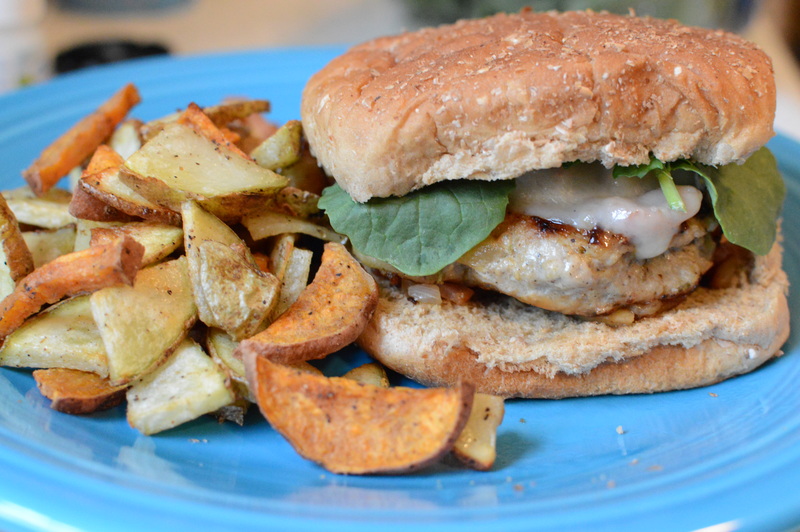 If you think this post may sound familiar, then you could be thinking of my more savory apple turkey burgers, but I promise, this burger I am about to share has a whole new flavor profile. When I say “sweet” and “apple” don’t think of pie, think of barbecue and smoked applewood. While this burger isn’t as savory as my last turkey burger, it’s definitely a fall must-try recipe that I don’t want you to be turned off to. I paired these burgers with this side, except, to tie into the sweet side of the burgers, I added some diced yams in with the rest of my potatoes. SO GOOD. In a skillet, start cooking your bacon until the edges begin to curl up. Add your apples and onion to the skillet, and cook until soft. Remove everything from the skillet, leaving in some bacon grease [you’ll use to cook the burgers in later]. Chop up your cooked bacon into tiny pieces and mix together with the apple and onion. In a large bowl, mix together your meat, spices, and bread crumbs. Add 2/3 of your apple-bacon mixture to your meat mixture. Form patties and cook in your bacon skillet. I dressed our burgers with swiss cheese and baby kale, on a toasted bun, smeared with mayo. Feel free to mix and match whatever toppings you want and as always, ENJOY! 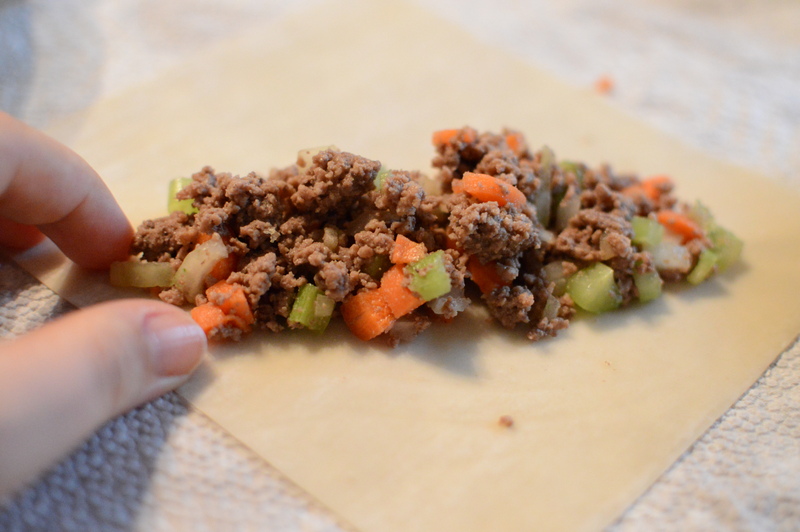 This recipe is so easy, I’m sure you’re wondering why it deserves its own post. First of all, nachos are one of my husbands favorite foods so, If nothing else, this is a love letter to him. 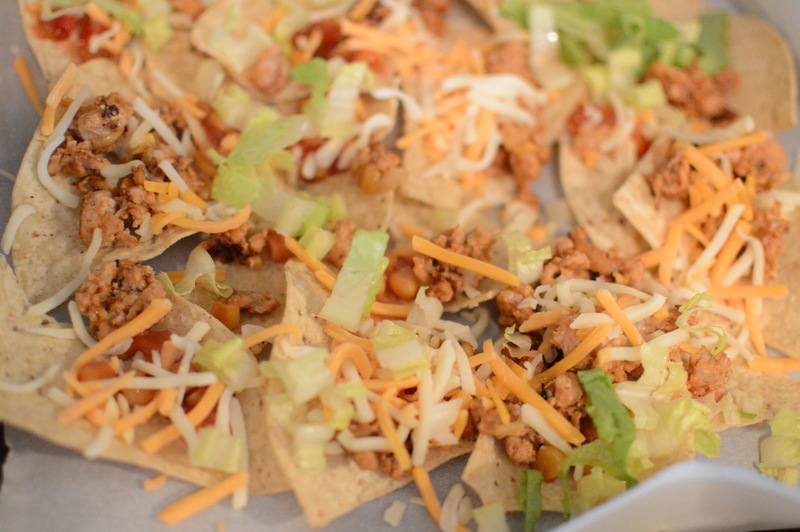 Otherwise, the thing I love about nachos is that you can totally dress these guys up by making your own tortilla chips and adding jalapenos and avocado… OR you can throw together nachos as a quick dinner with store bought chips, meat, and cheese. EASY. I preheated my oven to 400, lined a baking sheet with parchment paper and chips, cooked the meat in a skillet with: the taco seasoning, 1/4 cup of salsa, guacamole, and cream cheese. I sprinkled my meat over my nachos, spooned a little extra salsa on each of the bigger chips, then covered them all with the shredded cheese. 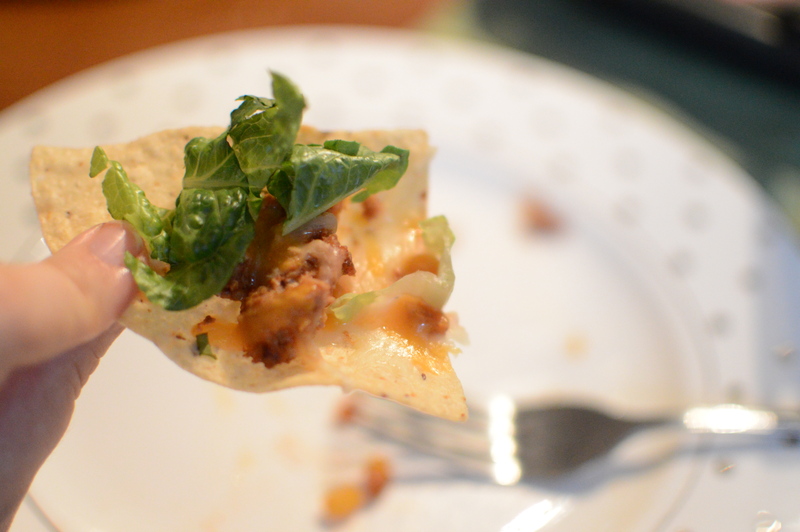 I baked them for 5 minutes, then topped them all off with some of that lettuce! I provided extra guac and salsa for dipping, but I loved them as they were and what is usually a restaurant appetizer, became a pretty filling meal!